Are you just beginning your search for a broadcast media monitoring service? If so, our "Checklist for Broadcast Media Monitoring Services" is perfect for you. 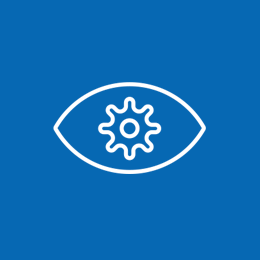 It's an unbiased list of the top 17 attributes to look for in a broadcast intelligence service; the items we've suggested you consider are based on the thousands of inquiries we handle every year for the TVEyes Media Monitoring Suite. 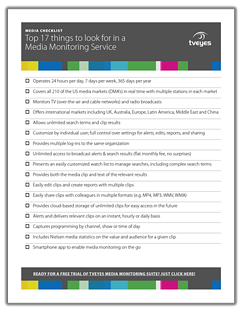 The checklist is free to download, and we hope you find it useful as you search for a broadcast media monitoring service. TVEyes makes it easy to search TV, report on results and prove the value of your efforts.With instant access to every domestic media market – local, regional, national – as well as unmatched global reach, TVEyes helps you pinpoint exactly the right clip instantly.